Today we have a talk by the artists and refugees involved in The Listening Room: Refugee Arts Project, at 4 pm, followed by a special presentation by Playback Theatre. Want to know more? Read summer intern Oliver’s impressions of the exhibition and stop by this afternoon! The Listening Room, Refugee Art Project, curated by Sally Brucker was a collaborative effort, by seven artists, one poet, and eight refugees from different countries. Each refugee was paired with an artist who listened to their story and created from it a work of art to share the refugee’s unique experiences and shared connections. Set apart from the rest of the gallery, it is as if you are stepping into a small world filled with the sounds and stories of these displaced persons. Each artist offers a unique lens for the refugees’ experiences to be shared through, creating a distinctive conversation between the experiences of all partaking in this project. In Untitled, by Nicole Salimbene, the story of a refugee named Fetunwork was conveyed through a painting of clustered buildings that was severed down the middle and loosely sewn back together. Salimbene highlights the space we can reach within ourselves when we remove ourselves from the distraction of the outside world and just listen. The buildings were collaged with clippings from advertisements and images of windows, creating a juxtaposition between the consumer culture and modern designs of the magazines, and the earth-toned simplistic buildings and laundry lines. To the right, Kian’s Prayer, by Pauline Jakobsberg, Viola’s story is told through a mix of bright and muted colors, with snippets of conversations scrawled across the painting. The contrasting colors convey the conflict between the activities and joy in Kian’s day-to-day life, and the sorrow of his mother learning to live in such a foreign place and culture. The painting features a dress, harkening to some of Jakobsberg’s other works, and creates a link between the artist and the storyteller. Leaning against the other wall, Memory, by Sally Brucker, encapsulates a photo from Manijeh’s wedding day. 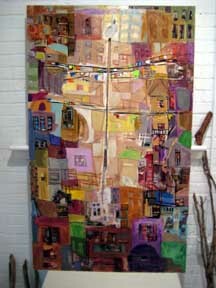 Manijeh is drawn in the middle, flanked by her mother and mother-in-law, and layered in textured fabrics. Manijeh is wearing a traditionally western wedding dress, where as the women standing beside her are garbed in traditional chador coverings. Manijeh sewed the threads used in the artwork herself, and wrote the poem in farsi on her dress, and there are passport images of Manijeh in her mother-in-law’s clothing. To the left, Searching, by Terry Svat, conveys how Abourass kept his faith in God through the all of the pain brought on by his long journey from Darfur . The painting features a sand-colored background, with small, earth-toned figures to symbolize the trampled earth, and a cross cut from the background to show his lasting faith in God. Svat bound the painting in a cross made of twine with plaster cast hands holding it on either side. This was her way of holding the piece together, but it also shows how Abourass was able to hold it together through his faith in God. Wow! Ron really pulled out all the stops with his first solo show as a WPG member! He has sculpture, monoprints, and sculpted monoprints of all different shapes and sizes. If that wasn’t enough, we also have The Listening Room-Refugee Art Project installed in the Press Room this month. We hope the images below entice you to come to the opening reception, this Saturday, 1-4 pm. We’ve had (and have scheduled) some great Press Room shows for 2013, including the current exhibition, In My Nature by Robin Gibson. 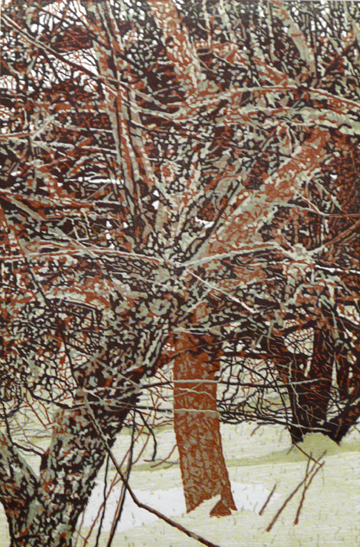 Are you a printmaker interested in having a show in the Press Room this year? It’s great for a student (or student group) just starting to build a resume of solo shows, for an artist wishing to exhibit a smaller body of work or a specific suite of prints, or for someone who wants to try out something that’s a little more experimental–we’re really looking forward to the multi-media installation by Refugee Art Project next month! As long as the work is 75% related to paper-making, print arts, or book arts, we’ll consider it. There is NO FEE to apply! Deadline is August 17, and notifications go out in mid-September. Want more information? Check out the full prospectus on our website. Our opening reception is tomorrow, along with Peggy’s talk at 2 pm! We hope to see you there to check out some of this great work in person! 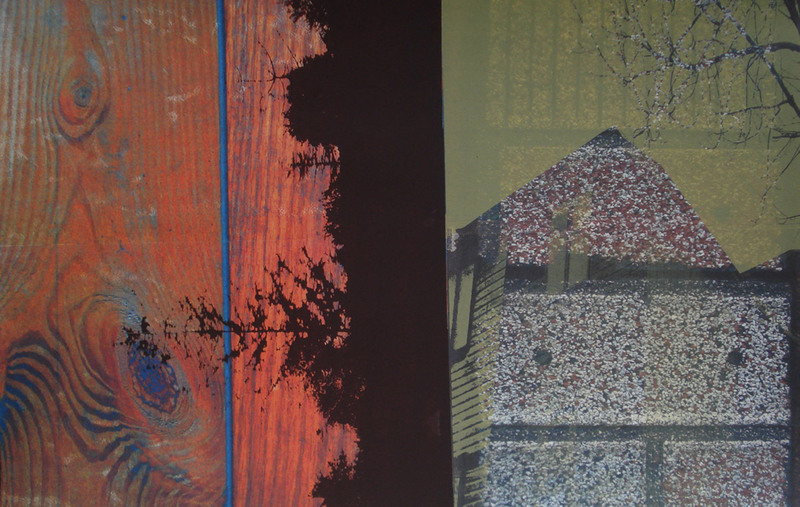 Exclusively on DCimPRINT: a sneak peek of Robin Gibson’s prints that will be up in the Press Room in May. These prints aren’t even on the website! Come by to see In My Nature next week.